Gypsum is a soft sulfate mineral composed of calcium sulfate dihydrate, with the chemical formula CaSO4·2H2O. It is widely mined and is used as a fertilizer and as the main constituent in many forms of plaster, blackboard chalk and wallboard. A massive fine-grained white or lightly tinted variety of gypsum, called alabaster, has been used for sculpture by many cultures including Ancient Egypt, Mesopotamia, Ancient Rome, the Byzantine Empire and the Nottingham alabasters of Medieval England. Gypsum also crystallizes as beautiful translucent crystals of selenite (mineral). It also forms as an evaporite mineral and as a hydration product of anhydrite. Scratch hardness tests are used to determine the hardness of a material to scratches and abrasion. The earliest test was developed by mineralogist Friedrich Mohs in 1820. It is based on relative scratch hardness, with talc assigned a value of 1 and diamond assigned a value of 10. Mohs' scale had two limitations; it was not linear, and most modern abrasives fall between 9 and 10. There are a large number of hardness testing methods available. Although it is impossible in many cases to give an exact conversion, it is possible to give an approximate material-specific comparison table e.g. for steels. 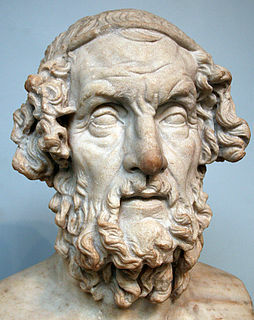 The word gypsum is derived from the Greek word γύψος (gypsos), "plaster". 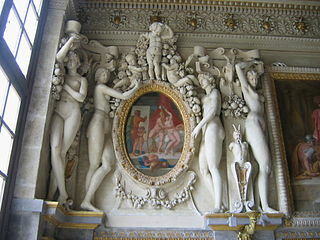 Because the quarries of the Montmartre district of Paris have long furnished burnt gypsum (calcined gypsum) used for various purposes, this dehydrated gypsum became known as plaster of Paris. Upon addition of water, after a few tens of minutes plaster of Paris becomes regular gypsum (dihydrate) again, causing the material to harden or "set" in ways that are useful for casting and construction. Montmartre is a large hill in Paris's 18th arrondissement. It is 130 m (430 ft) high and gives its name to the surrounding district, part of the Right Bank in the northern section of the city. The historic district established by the City of Paris in 1995 is bordered by rue Caulaincourt and rue Custine on the north, rue de Clignancourt on the east, and boulevard de Clichy and boulevard de Rochechouart to the south, containing 60 ha. Montmartre is primarily known for its artistic history, the white-domed Basilica of the Sacré-Cœur on its summit, and as a nightclub district. The other church on the hill, Saint Pierre de Montmartre, built in 1147, was the church of the prestigious Montmartre Abbey. On August 15, 1534, Saint Ignatius of Loyola, Saint Francis Xavier and five other companions bound themselves by vows in the Martyrium of Saint Denis, 11 rue Yvonne Le Tac, the first step in the creation of the Jesuits. Gypsum was known in Old English as spærstān, "spear stone", referring to its crystalline projections. (Thus, the word spar in mineralogy is by way of comparison to gypsum, referring to any non-ore mineral or crystal that forms in spearlike projections). In the mid-18th century, the German clergyman and agriculturalist Johann Friderich Mayer investigated and publicized gypsum's use as a fertilizer. Gypsum may act as a source of sulfur for plant growth, and in the early 19th century, it was regarded as an almost miraculous fertilizer. American farmers were so anxious to acquire it that a lively smuggling trade with Nova Scotia evolved, resulting in the so-called "Plaster War" of 1820. In the 19th century, it was also known as lime sulfate or sulfate of lime. Spar is an old mining or mineralogy term used to refer to crystals that have readily discernible faces. A spar will easily break or cleave into rhomboidal, cubical, or laminated fragments with smooth shiny surfaces. Johann Friedrich Georg Hartmann Mayer was a German Reformed pastor and agricultural reformer, who is considered one of the most important writers on agriculture of his time. He came to prominence through his efforts to promote agricultural reforms, especially with his 1769 publication with new regimes of crop rotation, and his 1773 textbook on rural householders and husbandry. Brine is a high-concentration solution of salt in water. In different contexts, brine may refer to salt solutions ranging from about 3.5% up to about 26%. 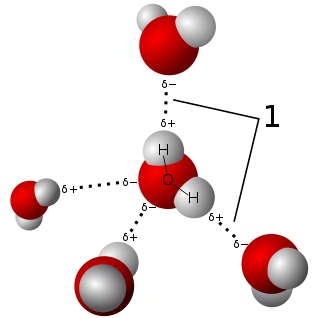 Lower levels of concentration are called by different names: fresh water, brackish water, and saline water. Sodium chloride, commonly known as salt, is an ionic compound with the chemical formula NaCl, representing a 1:1 ratio of sodium and chloride ions. With molar masses of 22.99 and 35.45 g/mol respectively, 100 g of NaCl contains 39.34 g Na and 60.66 g Cl. Sodium chloride is the salt most responsible for the salinity of seawater and of the extracellular fluid of many multicellular organisms. In its edible form of table salt, it is commonly used as a condiment and food preservative. Large quantities of sodium chloride are used in many industrial processes, and it is a major source of sodium and chlorine compounds used as feedstocks for further chemical syntheses. A second major application of sodium chloride is de-icing of roadways in sub-freezing weather. Gypsum is a common mineral, with thick and extensive evaporite beds in association with sedimentary rocks. 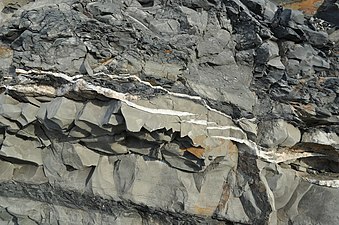 Deposits are known to occur in strata from as far back as the Archaean eon. Gypsum is deposited from lake and sea water, as well as in hot springs, from volcanic vapors, and sulfate solutions in veins. Hydrothermal anhydrite in veins is commonly hydrated to gypsum by groundwater in near-surface exposures. It is often associated with the minerals halite and sulfur. 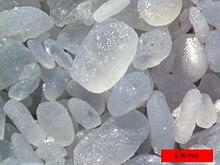 Gypsum is the most common sulfate mineral. Pure gypsum is white, but other substances found as impurities may give a wide range of colors to local deposits. Because gypsum dissolves over time in water, gypsum is rarely found in the form of sand. However, the unique conditions of the White Sands National Monument in the US state of New Mexico have created a 710 km2 (270 sq mi) expanse of white gypsum sand, enough to supply the construction industry with drywall for 1,000 years. Commercial exploitation of the area, strongly opposed by area residents, was permanently prevented in 1933 when president Herbert Hoover declared the gypsum dunes a protected national monument. Commercial quantities of gypsum are found in the cities of Araripina and Grajaú in Brazil; in Pakistan, Jamaica, Iran (world's second largest producer), Thailand, Spain (the main producer in Europe), Germany, Italy, England, Ireland, Canada  and the United States. Large open pit quarries are located in many places including Fort Dodge, Iowa, which sits on one of the largest deposits of gypsum in the world,[ citation needed ] and Plaster City, California, United States, and East Kutai, Kalimantan, Indonesia. Several small mines also exist in places such as Kalannie in Western Australia, where gypsum is sold to private buyers for additions of calcium and sulfur as well as reduction of aluminum toxicities on soil for agricultural purposes. Gypsum board  is primarily used as a finish for walls and ceilings, and is known in construction as drywall, wallboard, sheetrock or plasterboard. Tests have shown that gypsum can be used to remove pollutants such as lead  or arsenic   from contaminated waters. Celestine or celestite is a mineral consisting of strontium sulfate (SrSO4). The mineral is named for its occasional delicate blue color. Celestine and the carbonate mineral strontianite are the principal sources of the element strontium, commonly used in fireworks and in various metal alloys. Calcium hydroxide (traditionally called slaked lime) is an inorganic compound with the chemical formula Ca(OH)2. It is a colorless crystal or white powder and is obtained when calcium oxide (called lime or quicklime) is mixed, or slaked with water. It has many names including hydrated lime, caustic lime, builders' lime, slack lime, cal, or pickling lime. Calcium hydroxide is used in many applications, including food preparation, where it has been identified as E number E526. Limewater is the common name for a saturated solution of calcium hydroxide. Potassium sulfate (in British English potassium sulphate (SOP), also called sulphate of potash, arcanite, or archaically known as potash of sulfur) is the inorganic compound with formula K2SO4. It is a white water-soluble solid. It is commonly used in fertilizers, providing both potassium and a source of sulfur. The Naica Mine of the Mexican state of Chihuahua, is a working mine that contains extremely large selenite crystals. Located in Naica in the municipality of Saucillo, the Naica Mine is a lead, zinc and silver mine operated by Industrias Peñoles, Mexico's largest lead producer. Caverns discovered during mining operations contain crystals of selenite (gypsum) as large as 1.2 m (4 ft) in diameter and 15 m (50 ft) long. Peñoles announced in October 2015 that it was indefinitely suspending operations at Naica Mine. Gypcrete or gypcrust is a hardened layer of soil, consisting of around 95% gypsum. Gypcrust is an arid zone duricrust. 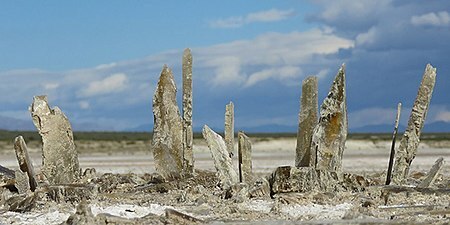 It can also occur in a semiarid climate in a basin with internal drainage, and is initially developed in a playa as an evaporate. Gypcrete is the arid climate's equivalent to calcrete, which is a duricrust that is unable to generate in very arid climates. Glauberite is a monoclinic sodium calcium sulfate mineral with the formula Na2Ca(SO4)2. ↑ Anthony, John W.; Bideaux, Richard A.; Bladh, Kenneth W.; Nichols, Monte C., eds. (2003). "Gypsum" (PDF). Handbook of Mineralogy(PDF)|format= requires |url= (help). V (Borates, Carbonates, Sulfates). Chantilly, VA, US: Mineralogical Society of America. ISBN 978-0962209703. ↑ Smith, Joshua (2007). Borderland smuggling: Patriots, loyalists, and illicit trade in the Northeast, 1780–1820. Gainesville, FL: UPF. pp. passim. ISBN 978-0-8130-2986-3. ↑ García-Ruiz, Juan Manuel; Villasuso, Roberto; Ayora, Carlos; Canals, Angels; Otálora, Fermín (2007). "Formation of natural gypsum megacrystals in Naica, Mexico" (PDF). Geology. 35 (4): 327–330. Bibcode:2007Geo....35..327G. doi:10.1130/G23393A.1. hdl:10261/3439. ↑ Cockell, C. S.; Raven, J. A. (2007). "Ozone and life on the Archaean Earth". Philosophical Transactions of the Royal Society A. 365 (1856): 1889–1901. Bibcode:2007RSPTA.365.1889C. doi:10.1098/rsta.2007.2049. PMID 17513273. ↑ Deer, W.A. ; Howie, R.A.; Zussman, J. (1966). An Introduction to the Rock Forming Minerals. London: Longman. p. 469. ISBN 978-0-582-44210-8. ↑ "Mines, mills and concentrators in Canada". Natural Resources Canada. 24 October 2005. Archived from the original on 13 March 2005. Retrieved 27 January 2007. ↑ Van Driessche, A.E.S. ; Benning, L. G.; Rodriguez-Blanco, J. D.; Ossorio, M.; Bots, P.; García-Ruiz, J. M. (2012). "The role and implications of bassanite as a stable precursor phase to gypsum precipitation". Science . 336 (6077): 69–72. Bibcode:2012Sci...336...69V. doi:10.1126/science.1215648. PMID 22491851. ↑ "CDC – NIOSH Pocket Guide to Chemical Hazards – Gypsum". www.cdc.gov. Retrieved 2015-11-03. ↑ Oster, J. D.; Frenkel, H. (1980). "The chemistry of the reclamation of sodic soils with gypsum and lime". Soil Science Society of America Journal . 44 (1): 41–45. Bibcode:1980SSASJ..44...41O. doi:10.2136/sssaj1980.03615995004400010010x. ↑ Ley, Willy (October 1961). "The Home-Made Land". For Your Information. Galaxy Science Fiction. pp. 92–106. ↑ "Tech sheet for yeast food" (PDF). Lesaffre Yeast Corporation. Archived from the original (pdf) on November 2014. Retrieved 1 March 2013. ↑ Astilleros, J.M. ; Godelitsas, A.; Rodríguez-Blanco, J.D. ; Fernández-Díaz, L.; Prieto, M.; Lagoyannis, A.; Harissopulos, S. (2010). "Interaction of gypsum with lead in aqueous solutions". Applied Geochemistry. 25 (7): 1008. Bibcode:2010ApGC...25.1008A. doi:10.1016/j.apgeochem.2010.04.007. ↑ Rodriguez, J. D.; Jimenez, A.; Prieto, M.; Torre, L.; Garcia-Granda, S. (2008). "Interaction of gypsum with As(V)-bearing aqueous solutions: Surface precipitation of guerinite, sainfeldite, and Ca2NaH(AsO4)2⋅6H2O, a synthetic arsenate". American Mineralogist. 93 (5–6): 928. Bibcode:2008AmMin..93..928R. doi:10.2138/am.2008.2750. 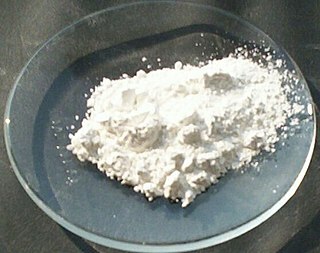 Wikimedia Commons has media related to Gypsum . "Gypsum" . The American Cyclopædia . 1879.